Last year Meg did up a couple of sketches for the blog and my job was to make something with those sketches. Then she went through a dry spell where she was overthinking them so she gave it up and just started to draw things (meanwhile, I have some fabulous Star War scenes that she has since created!). Last week I gave her one of my stamped penguins from TAC to fool around with. Before you know it, she comes up with a card created. I really liked the layout so I challenged myself to create a card with her design. Here is Meg's finished card. And here is my version of Meg's design. The background is created using red line tape and Martha Stewart glitter. The words are from Spunky Stamps (yes, the last thing I did was stamp that crooked joy but I'll just have to learn to live with it). The bella is from Stamping Bella. She's paper pieced and colored with prismacolor pencils and baby oil and for the heart I used a copic spica pen. I wanted a bit more sparkle so I added Swarovski crystals for the corner. Would you like to create a card with Meg's basic layout/design? If you do, please leave a comment - meg gets such a kick out of checking out your creations. Meg has gotten a taste of uploading her stuff on my blog and has decided she wants a bigger part of my blog. I told her that she could give a monthly sketch as her contribution. This month's sketch is more of a card shape, what you do with the card beyond that shape is up to you. Here is Meg's sketch. 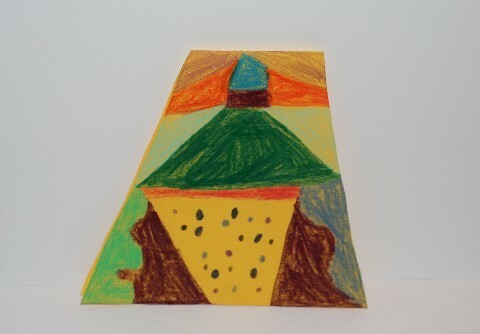 As I said, you can do whatever you want with the card as long as you get the basic shape. Meg used a scissors and freehand cut the edges so its a bit slanted differently on each side but you get the idea. And here is my version of Meg's sketch. The background stamp is from Cornish Heritage Farms and the topiary stamp is from Hollymark which I also got at Cornish Heritage. Both images are stamped with olive pastel chalk ink. 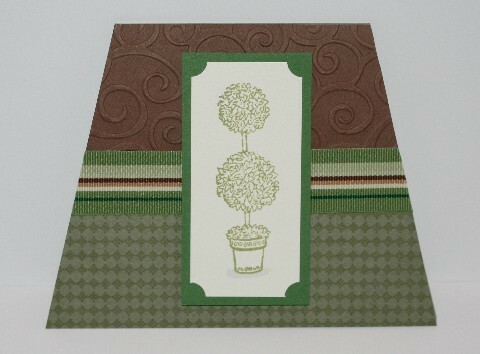 To create this shaped card, I measured in 1" from each side and cut on an angle. And now its your turn to create a card using Meg's sketch. If you do, link it back to here. Meg really wants to see what you can do. Night!